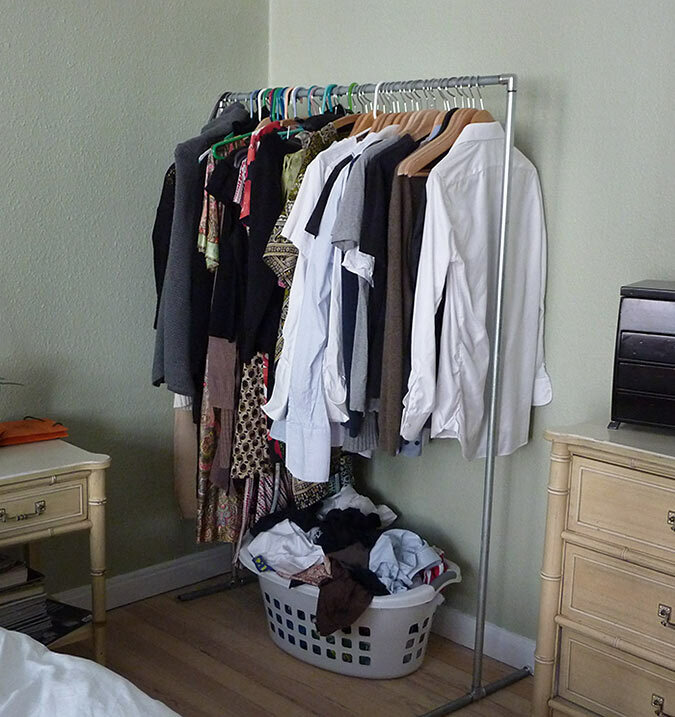 Closet space has been one of my biggest homemaking challenges in Denmark since day one. I actually blogged about this exactly 26 days after picking up the keys to my first Danish apartment. Many Aarhus city centre apartments come with storage space under the roof, but our building traded its space a few years ago to finance a new roof and windows. It made good (if shortsighted) sense to make this trade. The owners’ association saved a bundle and the contractor made a killing by converting the under roof space to in-demand apartments. This happened before Robert bought our apartment and I give him a verbal spanking at least once a day for buying an apartment without storage space! Literally every item we own is stored within our apartment, which doesn’t have any built-in closets. We both have a couple of decades of artifacts and we’re in desperate need of attractive (and effective) small space living storage solutions, which we can’t seem to find. We have stuff stored under and behind every possible piece of furniture, we have shelves hung in odd places like over the bathroom door, we actually store stuff in our luggage when we’re not traveling, and opening any one of our kitchen cupboards could cause a deadly avalanche! 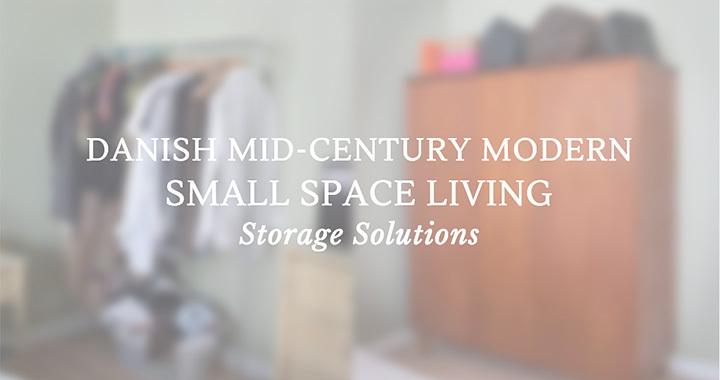 I’d love to tell you that I’m clever enough to have cracked the small space living storage code and have like 1001 small space living storage solutions to share with you, but I haven’t. 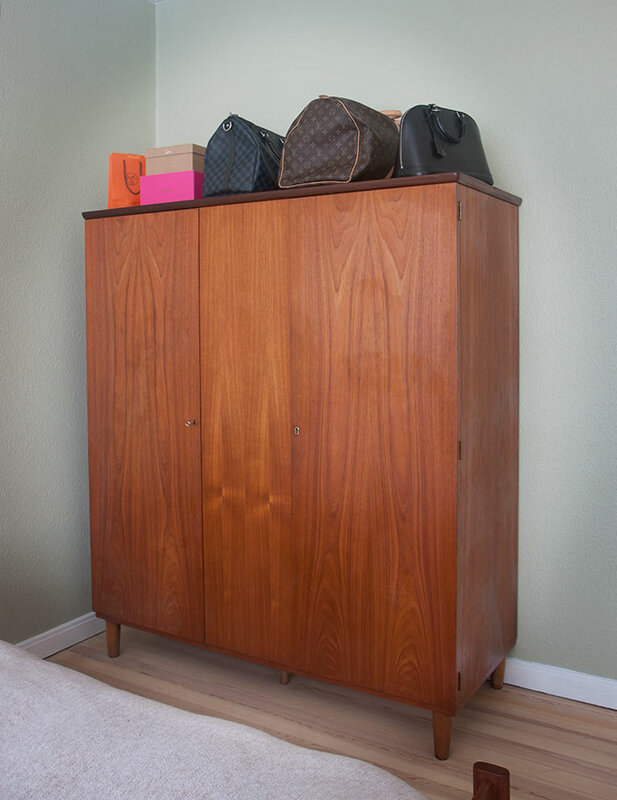 Instead, I’ll show you how I’ve managed to tidy up one out of control corner of our bedroom, then I’ll show you a pretty piece of Danish mid century modern furniture that’s almost a panacea for my storage woes. When Robert moved into this place, he thought he was brilliant buying pipes from the hardware store and screwing them together to form a clothes rack. I’ll give him a B for creativity, but look at this clutter! It’s been the bane of my existence since I moved in with him over two years ago. 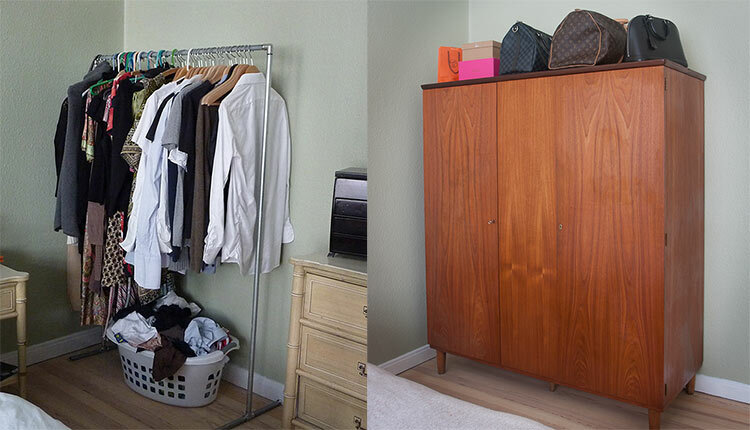 Fortunately, we’ve finally found a Danish mid century modern teak wardrobe, and this clutter is a thing of the past! This wardrobe is awesome! Its footprint isn’t that much bigger than the DIY clothes rack it replaced, yet it hides the laundry basket and holds quite a few more hanging clothes. It also has five shelves to house Robert’s growing cashmere collection, and we can store luggage, handbags, shoeboxes, etc. on top of it. This is like the best 800 kr. (about. $120, excluding van rental) I’ve ever spent! We also found this awesome Danish mid century modern sideboard (“skænk” in Danish), which has solved many of my storage woes. I use it to store everything from records to photography equipment to groceries and kitchen tools! My biggest issue with small space living is the clutter. No matter how much I try to keep clutter under control, there’s always more clutter. I have a counter full of groceries that can’t fit into the cupboard. There’s a pile of books next to the bed because we don’t have space for a bookshelf. Boxes of cat litter have become part of The Oik’s bedroom decor because they’re half price if you buy three boxes at a time and we haven’t got anyplace to store them. My desk is cluttered with papers because I work from home… in our living room. And there’s a perpetual pile of shoes by the door because there really isn’t anywhere else to put them. My second biggest issue with small space living it that I don’t have room for my hobbies. My sewing machine is always packed away and when I do dig it out, it takes another 45 minutes to locate my thread, cutting mat, and other accoutrements. Then everything needs to be packed away again, so working on an actual project is pretty much impossible. My photography gear is mostly packed away, but I keep one of my cameras set up on a tripod so it’s ready to go. Or was ready to go… until one day while we were moving furniture around and I knocked the tripod and smashed one of my lenses. My camera body survived, but I’m down a very expensive 1.4 aperture lens, which wasn’t covered by insurance, plus there’s a huge knick in the floor where it hit. I exercise at home and drag out my mats and weights every morning, then put them away, but they can’t really be stashed completely out of sight, so they’re a constant eyesore in our living room. Robert builds his model airplanes at our dining table, which is actually in our hallway, so he has to pack them away whenever we want to eat. Despite our best intentions, this apartment isn’t a viable longterm solution. No amount of small space living storage solutions and lifestyle tweaks is going to make this work. So we’re still apartment hunting. In the meantime, I’m trying to make the best of a crap situation… and I get some pretty furniture as a consolation prize. I love your mid-century furniture. I hear you about clutter. It’s a constant battle to keep things contained. I’m with you on having the clothes in a cabinet rather than out in the open. A for effort for your creative hubby though :). The herringbone floors you have look gorgeous by the way! Those are *beautiful* pieces! 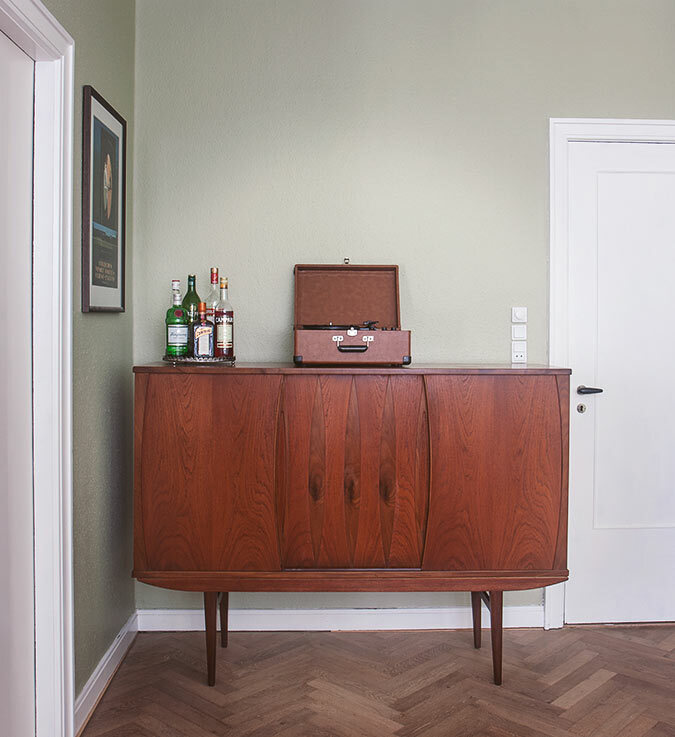 Is all vintage furniture so reasonably priced in Denmark or do you just know where to look? Also, as the other commenter noted, those are simply gorgeous herringbone floors! Thanks, Nicole! Vintage furniture is relatively inexpensive here, mid-century modern pieces are more expensive than earlier pieces, and pieces by known designers are of course not nearly as reasonably priced. It helps to know where to look, and to be patient and ready to pounce. Fortunately, as a freelancer, I don’t have a boss looking over my shoulder, so I can check for new listings a few times a day and be the first to call when an great piece shows up at a great price. The sideboard was listed at around 10am and by 5pm it was in my living room. I can only imagine how difficult it must be to live without things such as closets! All of mine get put to good use and it would be very hard to loose them if I moved! But you have thought of such great solutions! Thanks, Madi :) I was thoroughly shocked when I started property hunting here and discovered that built-in closets really aren’t a thing. Freestanding wardrobes are huge space hogs in already small rooms. It’s definitely changed how I shop. I would be lost without storage space! Where would I hide all of my clutter when guests pop in? Haha! All kidding aside, I am in love with your teak wardrobe! It is such a beautiful piece of furniture and definitely serves a great purpose! I prefer more of a rustic, weathered kind of look however, having said that, these pieces are beautiful. They are simple but still stand out in a room. I actually prefer a more eclectic shabby vintage look, but this is a style my husband and I can agree on. I think it’s a luxury to have so many mid-century modern pieces. They’re quite affordable in Denmark, but they’d cost an arm and a leg in the States! Indeed. There are loads of vintage furniture stores in my part of California that advertise when they receive containers full of art deco or mid-century pieces from Europe (especially Scandinavia). The pieces in good condition often cost as much as new, designer furniture from the likes of DWR or Room and Board. Clutter is a huge problem for my family. Soon, we will be moving to a smaller dwelling. I need all the small space living storage solutions I can get my hands on. Given the small living spaces in European cities, I expected better storage solutions, but people really just do not have a lot of stuff over here! Good luck with your move and with settling in to a smaller space. With any luck, I’ll be moving to a bigger one soon! That mid-century wardrobe is absolutely GORGEOUS! I think all of your lovely handbags look like art pieces on top…super way to show them off, yet store them, too. Storage in small spaces can be tricky, but I think you’ve done a great job. I do not know what I would do if I did not have closet space. I live in a home which has very small closets which most of my stuff is cluttering. Your ideas and your furniture choices are beautiful. UGGH living in NYC lack of closet space is seemingly the norm and drives us crazy. In our entire apartment for 4 people we only had 2 closets, actually 1.5. So we had to go to Ikea to buy some storage units too just to hide the clutter. These are really great storage solution ideas! I bet it’s tough living in a small space with lots of things – there’s so many tips and tricks that make it easier and this post was great for that! Especially if you live in a big city like in NY, closet space is hard to come by! Great post! I do like the furniture you picked, a lot. As a European, though, reading through the comments made me laugh. I honestly wouldn’t know where else to store my stuff than in cupboards, wardrobes, cabinets or whatever you would call loose furniture pieces. I also think limited storage space keeps you from buying too much stuff, which is very healthy. Who becomes a happier person through stuff? Thanks, Yola :) Changing my buying habits has been quite liberating! I often say that living in Europe has made me a bad consumer by American standards.